In 1993, the State of Maryland created the Canal Place Preservation & Development Authority to oversee the preservation, development, and management of the Canal Place Preservation District, a designated heritage area in Cumberland around the western end of the C&O Canal. Our ongoing mission is to honor and preserve local heritage and the C&O Canal and bring history to life for visitors and residents alike. With the adoption of a strategic management plan in 1996, the Authority laid the groundwork for development of a significant heritage tourism destination. The Authority has undertaken major rehabilitation and restoration projects. Some projects are already completed, including the renovation of the historic Western Maryland Railway Station. That grand building is now home to the administrative offices of the Canal Place Authority, the Western Maryland Scenic Railroad, the C&O Canal National Historical Park Cumberland Visitor Center, the Allegany County Visitor Center, gift shop and several professional offices. Renovation involved the complete rehabilitation of and replication of the dual canopies which originally graced the platform area of the Station. A third track was also laid for use as a display track, and the platform area was restored to its early 20th Century grandeur. Additional enhancements included a fountain and sculpture to the plaza in front of the Station and the extension of the brick walkway to connect with a new pedestrian bridge spanning Wills Creek. The bridge connects the Station and other areas of Canal Place with Riverside Park, site of the cabin used as George Washington’s headquarters here during the French and Indian War. In 2000, a replica of the canal boat “The Cumberland” and a million dollar interactive National Park Service C&O Canal exhibit opened, providing entertainment and education for visitors and local residents. In 2003, Shops at Canal Place opened with a full complement of themed retail, arts & crafts and dining tenants. The “Trestle Walk” project connects the station area with the C&O Canal towpath. This project provides a pedestrian walkway along a former railroad trestle which will ultimately cross the re-watered canal basin and terminate in an overlook at the Potomac River. The walkway follows the perimeter of the Crescent Lawn Festival Grounds. In 2018, the stabilization and reuse of the historic Footer Dye Works building, signage improvements, and expanded parking. Today, Cumberland’s transportation heritage is alive at Canal Place. 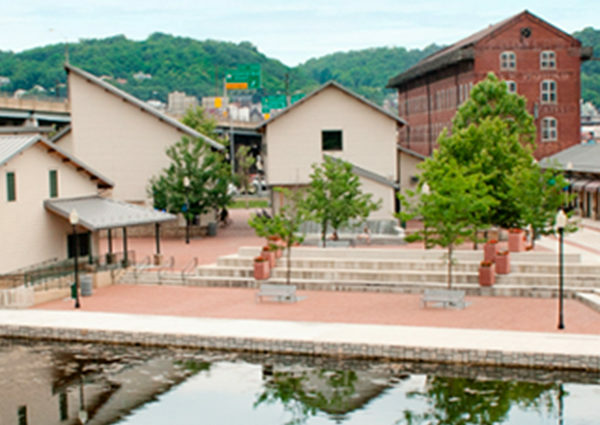 Visitors can ride a train, hike or bike the towpath or the Great Allegheny Passage, tour a full scale canal boat replica, learn about canal history at the C&O Canal National Historical Park’s Cumberland Visitor Center, enjoy live music and unique community festivals. Join us as we celebrate our canal heritage at Maryland’s first Certified Heritage Area, Canal Place!